Palm, M.M, Dallinga, M.G, van Dijk, E, Klaassen, I, Schlingemann, R.O, & Merks, R.M.H. (2014). 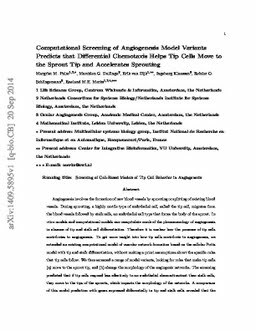 Computational screening of angiogenesis model variants predicts that differential chemotaxis helps tip cells move to the sprout tip and accelerates sprouting. arXiv.org e-Print archive. Cornell University Library .